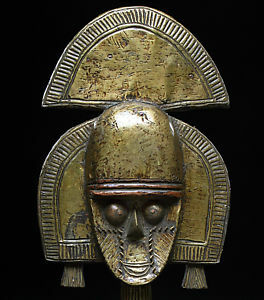 Types of Art: In Igala tradition, initiates from some parts of the kingdom, like Ankpa receive three deep over the cheeks on each side of the face, connecting the ears with the corners of their mouth, as a way of identifying each other. However, this practice is becoming less common, it's found in the helmet masks as well. History: The Igala are identified by the old oral tradition of Western Igbos as descendants of Igbo migrants who migrated westward during the expansion of the proto-Igbo peoples at the beginning of the1st millennium. The Yoruba are in turn identified by some Igalas as descendants who continued on west and eventually settled across Western Nigeria and Benin. Contemporary historians believe that the Igala most likely shared a proto-Kwa ancestry with the modern Igbo and Yoruba people as well as most ethnic groups of Nigeria today. Thus, the ethnic family would include not only the prior two, but groups like the Idoma, and the Nupe to the north.